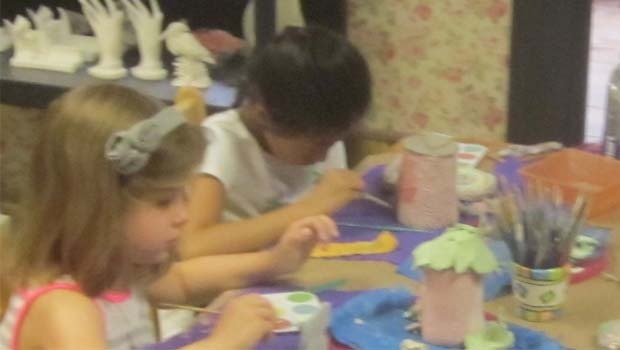 The Bee’s Knees Summer Camps in Northville allow kids ages 8 and up to work in clays, mosaics, glass, make jewelry, paint pottery and more all summer long. The Bee’s Knees camps take place at their studios in Northville and offer new and exciting themes throughout the summer that stir a child’s imagination and innovation using problem solving and critical thinking. There is no right or wrong way and with simple instructions campers are free to explore productively. Spend quality time creating your own original work of art! Confidence levels rise as campers amaze themselves with their artistic accomplishments. The Bee’s Knees Pottery Summer Camps are available for kids and tweens – ages 8+, or the advanced camp for 10+. Please feel free to send drinks and snacks. All of The Bee’s Knees Pottery 8+ Summer Camps are held from 10a-noon Mondays through Thursdays and are for kids ages 8+ or advanced camps for ages 10+. Choose 1 day camps for $35 per day or 4 day sessions of camp for $130. Register today by calling 248-347-6718 or visiting thebeeskneespottery.com. Beasts, unicorns, fairies, mermaids or whatever you can imagine. You pick the station where you want to work for the day. Clay, Pottery Painting, Canvas Painting and Polymer Clay. Explore the world creating your own art in pottery painting, glass fusing, canvas painting and clay sculpting. Just like famous artists throughout history. Get your passports stamped at each destination when we you out where each artist lived. August 12-15 – 10a-Noon – 8+ – Wands Up! It’s a great event to meet other wizards from the area. Dress in your favorite wizard get up or just slip in undetected. There will be multiple stations set up all week. You select what activities you create. Wands, monster books, potion bottles and more. You’ll have many different art forms along with electrical wiring and extra learning experiences. July 15-18 – 2p-4p – Ages 10+ – Zip It! Zipper Jewelry designs all week long. Explore different shapes and designs with silver clay charms, polymer add-ons and more. For more info on The Bee’s Knees Summer Camps, visit thebeeskneespottery.com.